Blah, been so busy with school lately! I'm a full-time student x2 so I don't have as much time to do my nails. I'm trying to make some time, though. It's a hobby of mine and I do it to relax. I did find out that my esthetician class allows pretty much anything on your nails as long as the polish isn't chipped and your nails are short, yay! Anyway, here's what I've had on my nails recently, first pic is from a magazine. Please ignore the tip wear, these were taken a couple days after I did my nails (oh, and a couple pieces of glitter are missing!). I tried using the little gold bullion beads but it was too difficult, the beads and glue were getting everywhere. It would have been a lot easier to use a tiny pop ball chain but I don't have one (yet). So, I thought some hex glitter would be a pretty good substitute. Also, in the magazine it looks like they used both pink and a peachy color, but I thought it would be a little too random-looking. It ends up looking pretty random anyway but I actually got lots of compliments (I think people like hearts!). 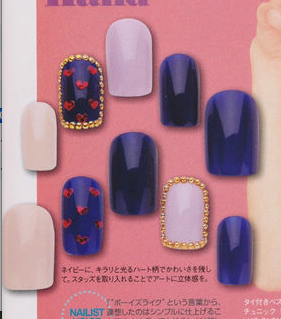 The navy blue jelly is Nfu-oh 119, the pink is Essie Neo Whimsical. I do really like the contrast of the navy and pink, I'll have to keep that in mind. This is so cute, L! Love the navy jelly. I had no idea you were going to school to become an esthetician, so exciting!! Thanks, T! It is pretty exciting, just a bit tiring.